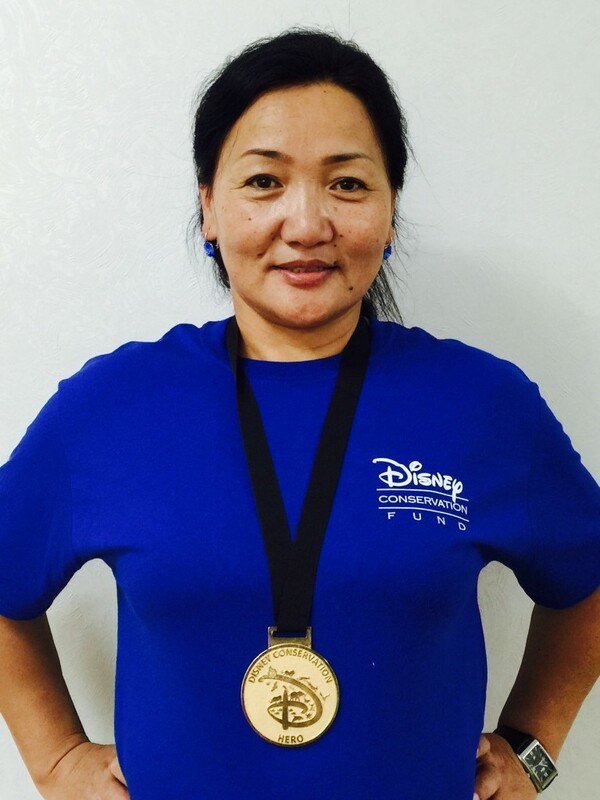 Disney Conservation Fund is honoring Tungalagtuya Khuukhenduu (above with students) with a 2015 Conservation Hero Award for her outstanding work in conservation education, and her dedication to engaging young people and fellow members of her community in environmental education programs. Tunga’s dream for Nomadic Nature Trunks is that it will someday be a government-supported program included in every school’s curriculum, and people will live in harmony with the Being in the Colorful Coat. Mongolia has long been a land of abundant wildlife and wild places, but today both are in jeopardy. Conservation education and collaboration at the school and community level are a critical component of the nation’s natural heritage. Yet with nearly half of the 3 million people in the country living in the remote steppes and mountains, traditional education settings are rarely possible at the community level. In 2007, Tungalagtuya Khuukhenduu (also known as Tunga) created the Nomadic Nature Trunk Program (NNT) to bring quality conservation education materials to the traditional nomadic cultures of Mongolia. Growing up in a family of eight children in a small village of South Gobi province, Tunga spent her childhood close to nature with her favorite pastimes being collecting flowers and butterflies, and finding unique stones and pieces of wood to use as toys. Family vacations were in the beautiful Gobi Gurvan saikhan mountain range and her summers were spent with her grandparents who lived in the Gobi Desert and had many livestock. While these summers were filled with hard work collecting branches and cow dung for fires, bringing water from deep wells a far distance away for livestock and human use, and processing dairy products, Tunga loved being with her grandparents. They held much knowledge of the natural world and freely shared it with her. She was always curious about the animals, plants, and insects around her, so her grandparents were wonderful teachers and encouraged her imagination. While in secondary school, Tunga was a member of a conservation club that had activities such as planting trees, nurturing house plants, and cleaning school grounds. However, no lessons were taught on the wild flora and fauna of Mongolia and environmental education didn’t play a part in her school’s curriculum. In 1994 Tunga graduated from the National University in Mongolia and began work as a wildlife biologist with a Dutch and Mongolian research team in Hustai Nuruu National Park. Her research included studying wolf population, behavior, and seasonal food trends, and mountain ungulate and bird observations. She was also in charge of training park rangers on wildlife observation methods and data collection. Her wolf diet research led her to interview herder families to collect data on livestock loss and wild animal carcass observations. Thus, every season she visited approximately 75 herding families to talk about wildlife and gather valuable information. It was during this time that she began to realize that the contributions of local people are so important for research work and nature conservation. She also noticed that these nomadic herding families had no access to much needed environmental education. For the next eight years, Tunga continued her wolf research work throughout Mongolia. In 2002, she became an educational specialist with the National Environmental Program implemented by the National University of Mongolia. During this time she focused on conducting trainings for biology teachers, but it was difficult as there was a significant lack of resources for environmental and ecological education and absolutely no conservation books for children. From 2004 to 2006, Tunga played a significant role with New Zealand Nature Institute’s “Community Based Conservation of the Gobi Region” program where she oversaw development of the “Co-Management for Conservation” project. Through this project she facilitated community trainings and community based wildlife monitoring, as well as strengthened already established Eco Clubs and local institutions for conservation. Through all of the work Tunga had been doing since graduating college, as well as her own experiences as a child, she saw the glaring reality that quality environmental education materials were greatly lacking not only for schoolchildren, but also for adults. So, when she was invited in 2007 by Wildlife Conservation Society of Mongolia to join in the development a curriculum for an education program in the Eastern Steppe region, she jumped at the opportunity and the result was the creation of the Nomadic Nature Trunk Program. 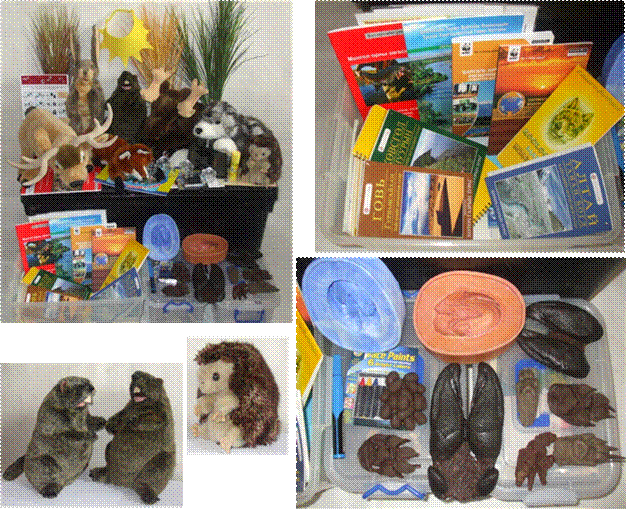 Nomadic Nature Trunks are traveling classrooms that provide a three-week curriculum, with interactive lesson plans and hands-on projects. Lessons are designed to promote positive perceptions of nature and the environment, increase scientific and cultural knowledge, and encourage environmental stewardship. 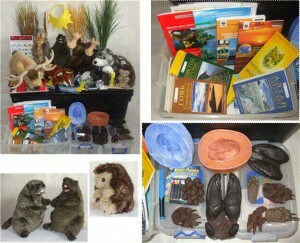 Each trunk includes activities and materials such as puppets, posters, maps, animal tracks, books and games focused on region-specific biodiversity and conservation concerns. In 2010, Tunga and Dolzodmaa Purevjav created Nomadic Nature Conservation (NNC), a new conservation organization for nomadic people throughout Mongolia based on the Nomadic Nature Trunk Program. NNC was able to expand the NNT Program as a resource for the wider community to include both adults and children. 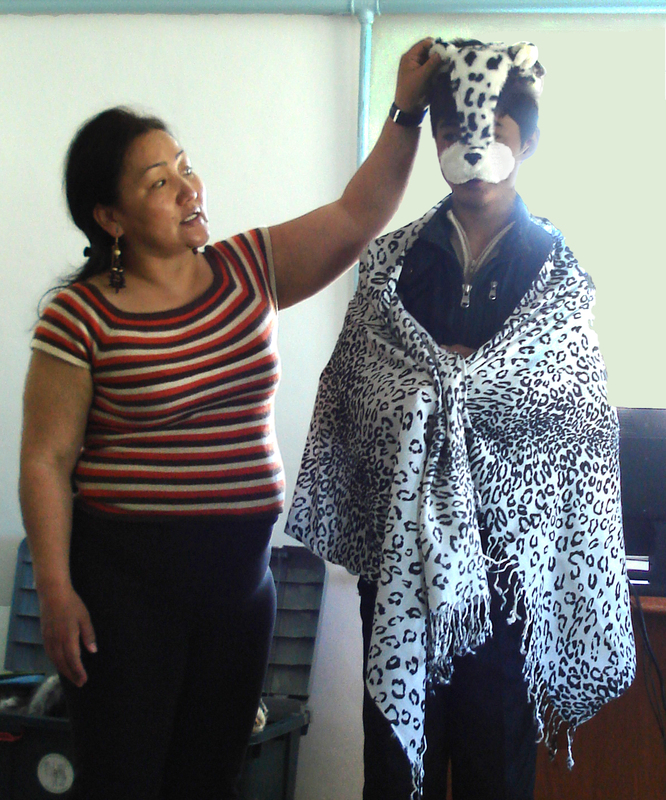 NNC staff hold trainings to teach the proper use of the materials in “train-the-trainer” workshops. In 2012, Snow Leopard Conservancy partnered with NNC to produce a set of trunks with activities focused on environmental education in the Altai Mountain region–key snow leopard habitat. Teachers and administrators have expressed interest in the program because it is compatible with the Education for Sustainable Development (ESD) curriculum, recently revised to incorporate environmental education into other subjects. Also, before the trunks were created National Park staff and community groups had a lack of materials for environmental outreach and education. Now these trunks are available to use in each area for a one month period. 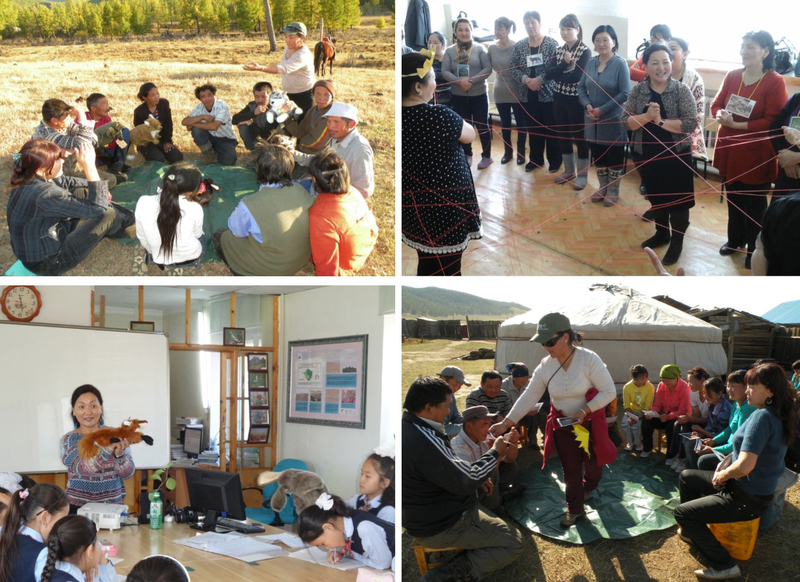 Staff of Gobi Gurvansaikhan National Park used a trunk as part of a cross-border summer camp with Mongolian, Chinese, and Russian participants which expands the impact even further. 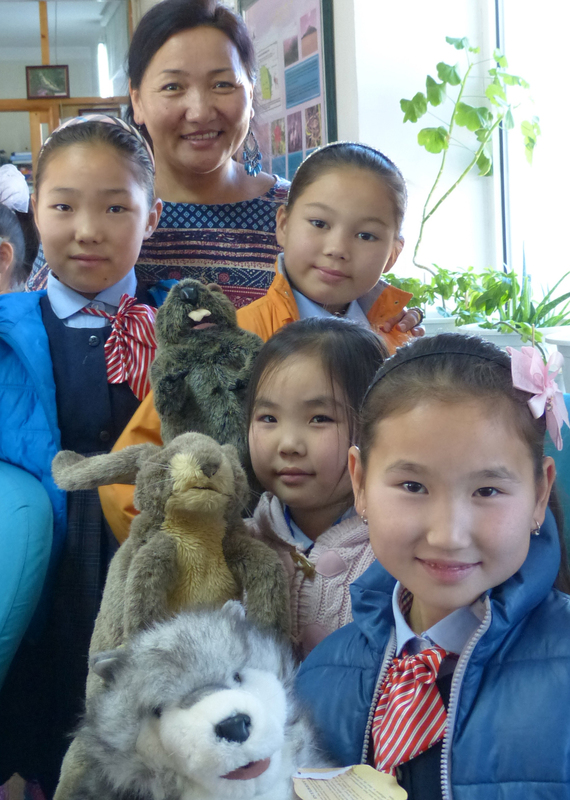 Tunga has shown extremely impressive dedication, creativity, and resourcefulness in creating and bringing essential environmental education materials to remote people throughout Mongolia–something no other organization is doing there. Her efforts are absolutely invaluable in the protection of Mongolia’s wildlife and wild places. Tunga’s dream for the Nomadic Nature Trunk Program is for it to someday be a nationwide government-supported program included in every school’s curriculum. In the meantime, she continues to give everything she can to NNC and the NNT Program to reach as many people as possible. Thank you Disney Conservation Fund for recognizing Tunga as the Conservation Hero she is!